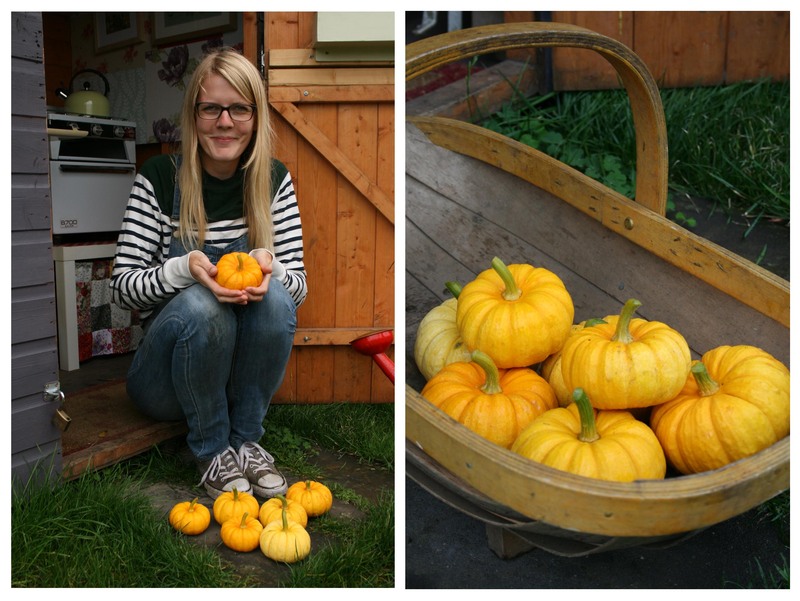 Home Allotment Munchkin Pumpkins Galore! It’s September and the harvesting season has been in full swing for a few weeks now, but there is one crop which has to be my overall favourite. And thats the Munchkin Pumpkins. I first saw this plant in the Sarah Raven catalogue, in the photograph she had it growing up a frame and I instantly thought it would look perfect growing over my hazel archway. I was also drawn in by the cuteness of the size and the shape! I sowed 6 seeds overall, they all germinated but sadly only 1 died (I acidentally snapped the stem!). Therefore I put 2 plants on one side of my archway and 3 on the other side, and it didn’t take long for them to take over the frame. I originally had the pumpkins, sweet peas and borlotto beans growing up the archway but the poor sweet peas hardly produced, whereas the beans and pumpkins thrived. I now have a huge bag of borlotto beans hanging and drying in the shed and theres a glut of pumpkins, not that I’m complaining! I am totally and utterly in love with these tiny pumpkins, just look how cute they are! Plus they taste absolutely delicious and they are so easy to grow. All I had to do was help them grow up the archway by securing the stems to the hazel, apart from that I didn’t do anything else to them and they have produced so many pumpkins. Definately a winner and one I will be growing next year! Stayed tuned for tomorrow’s blog post, there’s going to be another giveaway and it’s a beautiful one! Before I go I thought I would share the recipe on how I like to cook these little beauties, it’s rather simple but so delicious. Cut the top of the pumpkin off, trying to keep it as straight as possible. Remove the seeds inside with a spoon and hollow it out. Fill with the kale, chorizo and then add two teaspoons of extra thick cream (or fill nearly to the brim with cream). Replace the pumpkin lid and then roast in the oven for 45 minutes. Sounds tasty! Might give those a try next year. Sounds tasty! Might give those a try next year. I grew Atlantic giant pumpkins this year, but only got one and it was only slightly larger than your miniature ones. And unfortunately, something had caused it to split on the top and something ate the flesh – it was completely hollow. Do you know what might have caused this splitting? My butternuts grown in my polyhouse are doing fantastic and show no signs of stopping yet. We had one in risotto two nights ago. It weighed just shy of 4 pounds and didn’t have a single seed inside, which was strange as they are supposed to be heirloom. It tasted fantastic though! Oh I would love to grow giant pumpkins but my allotment is so tiny! The only thing I know about splitting is when the crop has erratic watering, my tomatoes did that alot in their trough because it got so dry quickly. Sorry I can’t help. 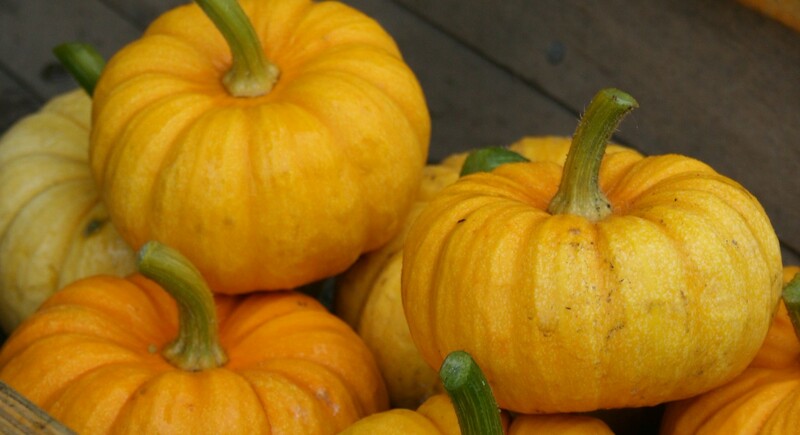 It seems to have been a great year to butternut sqaushes and that risotto sounds delicious! I grew Atlantic Giants a couple of different years. The largest was 157 lbs but although I was pleased with my success at the time, I found it to be a complete waste of time, energy and space since it is only a display piece. I grew it in somewhat boggy (wet lawn area) ground, sheltered by forest, with a ton of horse manure. Wow, they are so cute, I can’t wait to have a go at growing them myself next year……brilliant recipe, thanks for the inspiration. Love your blog….keep up the good work! They look great! Ive created an account with Sarah Raven so I can get these! Sounds like you have been very lucky with them… do you feed them at all whilst they are growing? Cute! I always thought those pumpkins were purely decorative, like gourds. 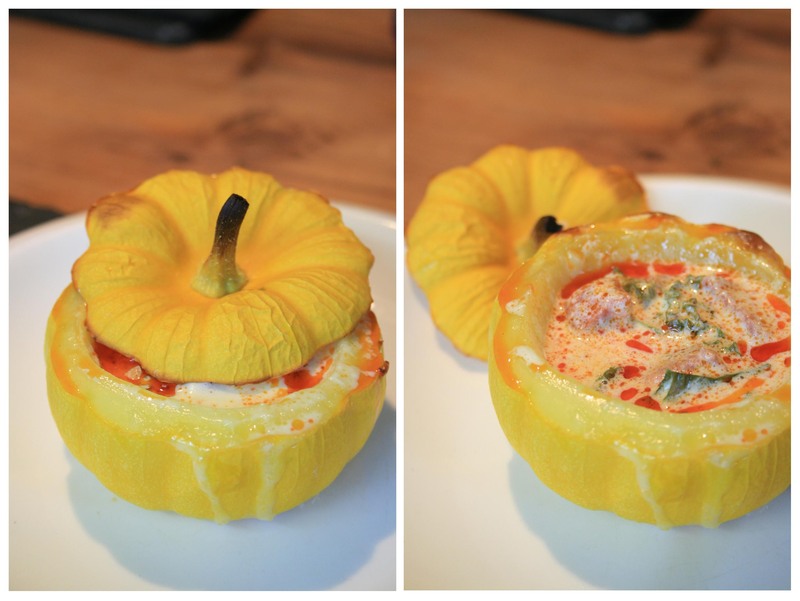 So, do you eat the inside of the pumpkin as you eat the Kale, Chorizo and cream, or is the pumpkin purely a vessel for whatever you put in it? 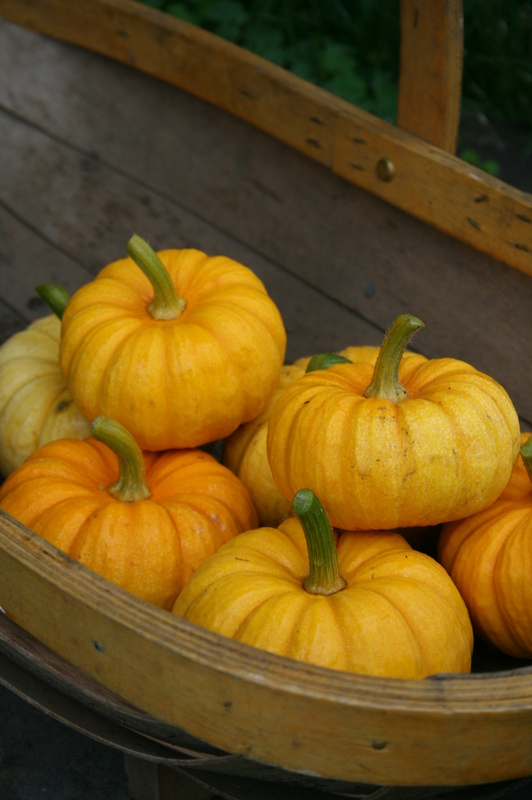 I’ve never had much luck with pumpkins – definitely trying these on an arch somewhere in the garden! Hi Katie, Just a quick question about the recipe. Do you put the chorizo in raw? I love this idea. I also thought that these mini pumpkins were only a decoration. Does this go by any other names? I’m in Canada and the closest I’ve come to finding this is one called “jack be nimble” they look super cute and I would love to grow some next year. Hi Katie. I’m growing these on my plot this year and they look to be doing really well. So far though, they are the size of an orange but are still yellow and completely smooth. Do the bumps and dips develope later on?